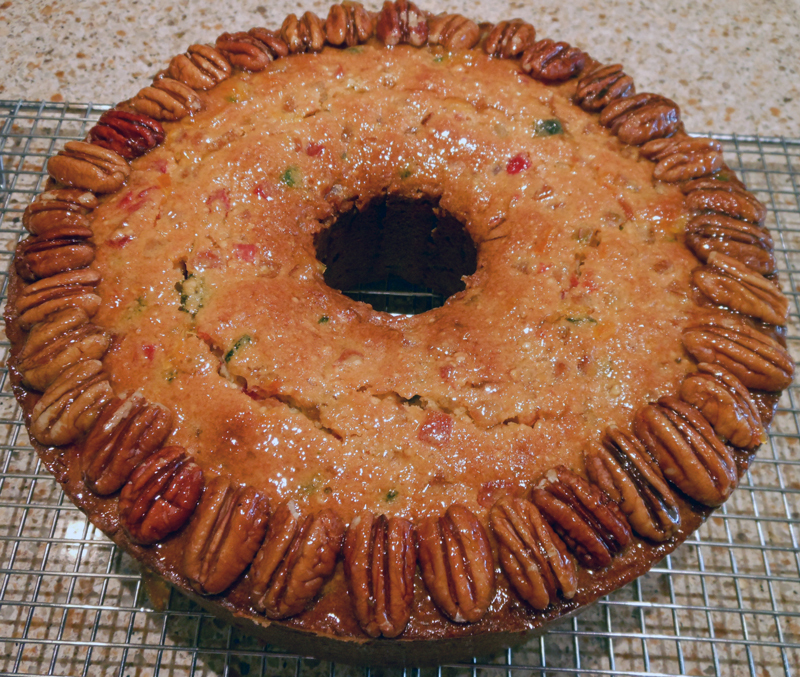 This fruitcake is for everyone that loves fruitcake, and for everyone who thinks they don’t like fruitcake. This is citrusy and light. Not soaked in alcohol! Adjust oven rack to lower-middle position and heat oven to 275 degrees. Generously grease 12-cup tube pan and line bottom with parchment paper. Microwave orange juice in medium bowl until hot, about 30 seconds. Add candied fruit and stir to coat completely. Let cool completely, about 15 minutes, stirring occasionally. Process almonds, coconut, and 1/4 cup flour in food processor until finely ground, about 1 minute. Transfer to second medium bowl and whisk in remaining 1 3/4 cups flour, baking powder and salt. Using stand mixer fitted with paddle, beat butter and sugar on medium-high speed until pale and fluffy, about 3 minutes. Add eggs, one at a time, and beat until combined. Reduce speed to low and add flour mixture in 3 additions, alternating with candied fruit in 2 additions, scraping down bowl as needed. Give batter final stir by hand. Pour batter into prepared pan and smooth top. Bake until skewer inserted in center comes out clean, about 2 hours, rotating pan halfway through baking. Let cake cool in pan on wire rack for 30 minutes. Remove cake from pan, discarding parchment and reinverting cake. Let cool completely, about 3 hours. You can decorate the top of your cake however you want. I brushed mine with melted orange marmalade (while it was still warm) and then lined pecans around the top edge and brushed the pecans with the marmalade. Or you could just dust the top with powdered sugar.